Military Intelligence Rings for those who care about our daily security. The US Amy School of Intelligence is located at Fort Huachuca, Arizona. Any enlisted personnel or officers who are in the military intelligence field attend this school. Many international students in military exchange programs attend also. Military Intelligence utilizes a number of different information collection and analysis mediums. Available data is used to determine a course of action or to provide an answer to focused questions. The commander’s specific needs for intelligence are considered and then incorporated into the intelligence collection process, as well as the analysis and dissemination of the information. Operational intelligence is more focused on support for an expeditionary commander. Tactical intelligence supports operations on a tactical level. Personnel in this area of military intelligence are usually attached to headquarters. Current threat levels are scrutinized and this information is then passed onto those that will be out into hostile territories. Intelligence tasking will focus on a number of different variables. The common goal is the collection, analysis, processing, and dissemination of information that will influence planning and operational strategy. Photographs can project speed and range. Maps can be used for various information gathering tactics. Counter-intelligence services make sure that some information available to our enemies will lead them down a misrepresented path. However, the media continues to be a primary source of information. Many people have a common misconception when it comes to the Army Military Intelligence Group. It is not full of spies and James Bond-like gadgets. Information gathering comes from a number of simple and complex sources, and each must be verified for its authenticity. Today’s Army military intelligence is one of the most impressive units in the United States Military. It helps protect our country against threats, both foreign and domestic. 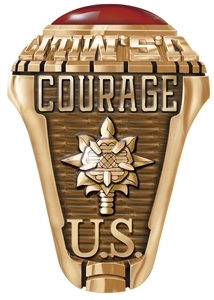 If you or a loved one have served in the Army’s Military Intelligence Division, then consider honoring this service with a custom Army ring. Show off the insignia of your unit by having it engraved on the side of one of the many styles of Army rings or even under a semi-precious stone on the top. These Army rings are unique reminder of the service and sacrifice of all soldiers and will likely become a treasured family heirloom. See the complete collection of army gifts at Military Online Shopping.